Choose Your Adventure #5: Vampire-O! The Choose Your Adventure Series is meant to be fun, social, friendly for beginners, yet interesting for seasoned veterans. Everyone starts together, so run head-to-head with your friends or against your rivals. Who will visit the most checkpoints within the time limit? Who will run the fastest? And with vampires roaming the woods at this event, who will avoid getting bitten? This format is great for beginners! With many checkpoints along trails and open areas, you’ll be sure to visit a lot! And if there’s one that’s hard to find, don’t worry, you can skip it and keep going. For the advanced navigators, the races will be a challenging exercise in figuring out the most efficient and optimal route to try to get them all (and avoid the vampires)! Obviously, vampires are only out at night, so you’ll need to bring a flashlight or headlamp! Come join the fun! Is this your first event or do you want to improve your skills? Meet us from 5:30pm – 6:30pm for up to an hour of free skills instruction! If you need a waiver to print and sign for a youth attending without parent/guardian, download here. There is just a one-size-fits-all race for beginners through advanced runners. Your goal is to visit as many checkpoints as you can (in any order you want), and to avoid the vampires, who are trying to bite you! It’s ghoulishly fun! The total time limit is 60 minutes! Each checkpoint has a unique pin-puncher, with which you punch your punchcard. For example, use the pin-puncher at checkpoint #1 to punch box #1 on your punchcard. There are 24 checkpoints on the course, all worth the same amount: 1 point. Therefore, the maximum score is 24 points. The first person or team returning with all 24 punches on a punchcard wins! But, there’s a twist! There are vampires running around the park, too, and if they bite you, you have to swap punchcards –and roles (you’re the new vampire! )– and then go bite someone else! You may be nearing a full punchcard and lose them all! Or you may have an empty punchcard and get lucky! Remember, the winner is the first person or team back with a full punchcard. You don’t necessarily need to visit all of the checkpoints! The 24 checkpoints are generally on the beginner and intermediate difficulty level, which is appropriate for a Vampire-O. How does the start work? At registration and check-in, we’ll give you a checkpoint map with a copy of the rules. Note: this is a change from previous years where we gave you the map right before the start. We usually have a lot of first-time orienteers at this event. Handing out maps earlier will help ensure that everyone gets a map, has time to understand the map and rules, and develop a plan before the start. Shortly before the start, we’ll go over the rules again and start handing out the punchcards. There will 4 randomly assigned vampires at the start of the race. 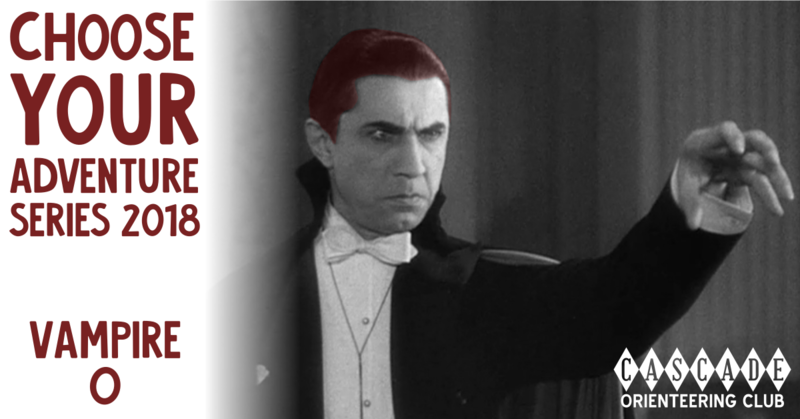 At 7:00pm sharp, we’ll yell GO!, and everyone except the vampires can scatter into the night. At 7:02pm, we’ll release the vampires to go chase you! Take exit 4 onto WA-169 S.
At the traffic circle, take the third exit onto SE 248th St.
Lake Wilderness features a mixture of open grassy areas, manicured gardens, and trails in the forest. Distinct features such as fences, buildings, and roads, will help novice navigators. The arboretum area, with its many small trails, provides a fun opportunity for orienteering ping-pong for advanced orienteers.